Harry Giles (PF, 6’9″, 2016) and PJ Dozier (CG, 6’4″, 2015) are two of the top basketball recruits in the nation, with Dozier holding offers from North Carolina, Kansas (among many others) and Giles holding offers from Duke, UNC, Kentucky, Georgetown and pretty much everyone else. But the recruiting world hasn’t seen them in a while; both had serious injuries that have kept them off of the court for some time. That will change this weekend, as both are participating in the Phenom Hoops Challenge with their respective AAU teams in Greensboro, NC. While it’s just their first time back in uniform, with such sought-after recruits, there is a lot of interest in how their recovery has gone thus far and how they look on the court. For fans of Kentucky, Duke, UNC, Kansas or any of the other far-flung schools that are actively recruiting the two players (among several other high profile recruits), many of the games on the final day of the event (Sunday) will be broadcast online at NetCastSports.com. Full schedule of the day’s broadcast coming soon, and we’ll have more information about the broadcast times – the games being broadcast on Sunday are several of the playoff games for the 17U teams at the tournament, so the final matchups won’t be set until the teams finish pool play. But we’ll work to keep everyone updated. You can also follow @NetCastSports on Twitter for more updates. There was quite a bit of speculation leading up to this announcement that Embiid might have had a change of heart after it seemed a near certainty that he would make this move earlier in the season. Embiid suffered nagging injuries this season but still managed to average almost a double-double as a freshman. Many consider Embiid the number one pro prospect in this year’s draft with this announcement. Want more basketball insight? You can follow Basketball Elite on Twitter, right now. 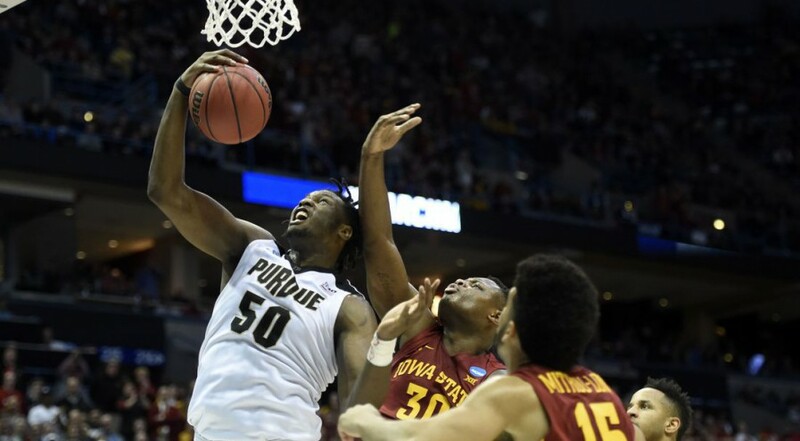 ST. LOUIS (USBWA) – The U.S. Basketball Writers Association has selected nine outstanding first-year players for its 2014 Integris Wayman Tisdale Award Midseason Watch List. Members of the association’s board of directors chose the players to be included on the list as contenders for the national freshman of the year award. The award is to be presented to the national freshman of the year at the Devon Energy College Basketball Awards on April 14 at the National Cowboy and Western Heritage Museum in Oklahoma City. The Oscar Robertson Trophy and the Henry Iba Coach of the Year Award will also be presented at the gala to be held annually the Monday following the NCAA Men’s Final Four. Six of the nine players are also featured on the Oscar Robertson Trophy Midseason Watch List as candidates for national player of the year. Teammates from Kansas (Joel Embiid and Andrew Wiggins) and Kentucky (Julius Randle and James Young) highlight the list. LSU’s Jordan Mickey gives the Southeastern Conference three players to lead all conferences. The ACC and Big 12 each boast two players. Syracuse’s Tyler Ennis, Arizona’s Aaron Gordon, Duke’s Jabari Parker and Indiana’s Noah Vonleh round out the list. Embiid, Ennis, Gordon, Parker, Randle and Wiggins were lauded yesterday among 23 players in the running for the Oscar Robertson Trophy. G 11 Tyler Ennis, Syracuse 6-2 180 Fr. Brampton, Ont. F 11 Aaron Gordon, Arizona 6-9 225 Fr. San Jose, Calif.
F 1 Jabari Parker, Duke 6-8 235 Fr. Chicago, Ill.
F 1 Noah Vonleh, Indiana 6-10 240 Fr. Haverhill, Mass. G 22 Andrew Wiggins, Kansas 6-8 200 Fr. Vaughan, Ont. G 1 James Young, Kentucky 6-6 215 Fr. Rochester Hills, Mich.
By conference: SEC (3); ACC (2); Big 12 (2); Big Ten (1); Pac-12 (1). The USBWA has chosen a national freshman of the year since the 1988-89 season when LSU’s Chris Jackson was the recipient. Last season, Oklahoma State’s Marcus Smart became the third winner of the Wayman Tisdale Award. Other notable previous winners of the national freshman of the year award include Kevin Durant, Carmelo Anthony, Jason Kidd and Chris Webber. This season, in a partnership with CBSSports.com and columnist Jeff Borzello, the USBWA has named a weekly Wayman Tisdale National Freshman of the Week. Embiid, Young and Parker have all been selected as national freshmen of the week this season. The Tisdale Award winner will receive a statuette designed by nationally-recognized sculptor Shan Gray. The April 14 banquet will also honor Kansas coach Bill Self as the recipient of the Wayman Tisdale Humanitarian Award. The late Wayman Tisdale was a three-time USBWA All-American at the University of Oklahoma. Following a stint on the 1984 U.S. Olympic basketball team, he played 12 seasons in the NBA before retiring in 1997 to focus on a blossoming jazz music career. In March 2007, he was diagnosed with cancer and, following a courageous and difficult battle that included the amputation of his right leg in 2008, he passed away in May 2009. The Integris Wayman Tisdale Freshman of the Year Award is produced by Access Sports, an Oklahoma City-based 501(c)(3) not-for-profit foundation responsible for creating the Wayman Tisdale Freshman of the Year Award. Access Sports produces all events associated with the award, including the annual awards dinner. Proceeds from the activities affiliated with the award are used to support various worthy charitable causes, including providing opportunities for disadvantaged youth to participate in basketball leagues, clinics, and training throughout the state. In addition, Access Sports supports the Wayman L. Tisdale Foundation which helps fund prosthetics for those who cannot afford the cost on their own and may not be covered by insurance. Tickets and sponsorship information for the Devon Energy College Basketball Awards are available atcollegebasketballawards.com or by contacting Scott Hill (405-749-1515, scott.hill@access-sports.net). The U.S. Basketball Writers Association was formed in 1956 at the urging of then-NCAA Executive Director Walter Byers. With some 900 members worldwide, it is one of the most influential organizations in college basketball. It has selected an All-America team since the 1956-57 season. For more information on the USBWA and its award programs, contact executive director Joe Mitch at 314-795-6821. As the Big 12 Conferennce Player of the Week, Tharpe was nominated for the weekly award, which was chosen by a representative of the USBWA board of directors from a list of Division I conference players of the week. Tharpe, a 5-11 junior from Worcester, Mass., led the Jayhawks to conference wins at No. 8 Iowa State and No. 9 Oklahoma State. In the wins that lifted Kansas to No. 8 in the Associated Press Top 25, Tharpe averaged 22.0 points, 5.0 assists and 4.0 rebounds while shooting a sizzling 82.4 percent from the field. He started the week with a career-high 23 points in the 77-70 win at Iowa State on 7-of-9 shooting before adding 21 points against in the 80-78 win vs. the Cowboys, making 7-of-8 shots from the field. Tharpe was 6-of-8 (.750) from three-point range during the week and connected on 9-of-10 (.900) from the free-throw line. This is the fifth season that the USBWA has selected a national player of the week. The weekly Oscar Robertson National Player of the Week will be considered for the Oscar Robertson Trophy watch list, which will be released at mid-season. Blue Ribbon College Basketball Yearbook, the most comprehensive college basketball publication in the world, returns for its 33rd season, bigger and better in 2013-14. Blue Ribbon – long-known as “The Bible of College Basketball” – gives its readers the most thorough, up-to-date and timely evaluations of every Division I team in the country. For more information about Blue Ribbon Yearbooks, visit blueribbonyearbookonline.com. ST. LOUIS (USBWA) – Kansas’ Wayne Selden Jr. is the Wayman Tisdale National Freshman of the Week for games ending the week of Jan. 12. 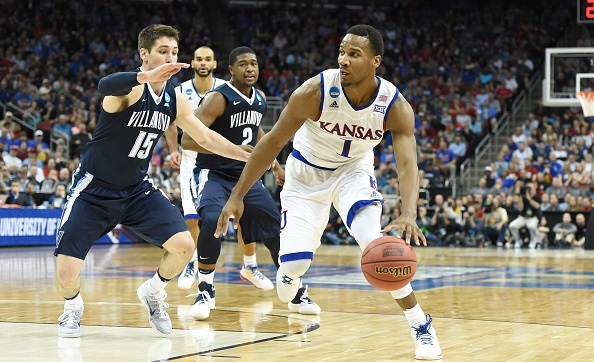 Selden was selected by CBSSports.com’s Jeff Borzello, in partnership with the U.S. Basketball Writers Association. Borzello’s popular weekly freshman watch column will continue to feature nation’s the top freshmen each week in addition to the national player of the week. Later in the season, the USBWA will release a midseason watch list before naming finalists for the award. This season marks the first time a weekly national freshman of the week will be selected and, each Tuesday through Feb. 25, a standout first-year player will be chosen for the honor. Selden, a 6-5 guard from Roxbury, Mass., helped lead the Jayhawks to two wins to start Big 12 play, averaging 22.0 points, 3.0 rebounds and 2.0 assists – while also knocking down 8-for-15 from 3-point range. Up first was a road trip to Oklahoma, where Selden was on fire from behind the arc. He made five 3-pointers en route to 24 points in the 90-83 victory over the Sooners. Considering he had averaged 7.7 points in the three games prior, Selden’s breakout game couldn’t have come at a better time. And then he followed it up with 20 points, four rebounds and three assists in a blowout of Kansas State. Overall, he made 16-for-27 from the field. On the season, Selden is now averaging 10.3 points, 2.8 rebounds and 2.1 assists. He is shooting 49.6 percent from the field, 42.6 percent from 3-point range, and 51.3 percent from the free-throw line. The Integris Wayman Tisdale Award is to be presented to the national freshman of the year at the Devon Energy College Basketball Awards on April 14, 2014, at the National Cowboy and Western Heritage Museum in Oklahoma City. The Oscar Robertson Trophy and the Henry Iba Coach of the Year Award will also be presented at the gala to be held annually the Monday following the NCAA Men’s Final Four. The USBWA has chosen a national freshman of the year since the 1988-89 season when LSU’s Chris Jackson was the recipient. Last season, Oklahoma State’s Marcus Smart became the third winner of the Wayman Tisdale Award. Other notable previous winners of the national freshman of the year award include Anthony Davis, Kevin Durant, Carmelo Anthony, Jason Kidd and Chris Webber. The Tisdale Award winner will receive a statuette designed by nationally-recognized sculptor Shan Gray. The April 14 banquet will also honor the recipient of the Wayman Tisdale Humanitarian Award. The U.S. Basketball Writers Association was formed in 1956 at the urging of then-NCAA Executive Director Walter Byers. With more than 900 members worldwide, it is one of the most influential organizations in college basketball. It has selected an All-America team since the 1956-57 season. For more information on the USBWA and its award programs, contact executive director Joe Mitch at 314-795-6821. Want to know more? You can follow Basketball Elite on Twitter, right now. Former KU guard Travis Releford isn’t shy about which types of shoes he loves, plus he has a ‘no music’ rule before games. Taylor with the first basket of the game with a driving lay-in- great sign for Kansas to get him started off well. Withey, probably the second best shot blocker in the nation, with an early block on T. Jones that sent a statement. MKG goes down awkwardly on a hard foul on Kansas in first minute and half- got up and knocked in his first FT.
Kansas better figure out a way to stop Kentucky in transition or its going to be a long night for the Jayhawks. Teague starting to get hot. Jones is letting Robinson establish way too deep position multiple times. Fast pace for both teams- looking for a break in the action. The officials are letting them play this game- physical play both ways. Withey answers a 14-4 run by UK with 3-point way. Kentucky is finishing with scores in the lane and Kansas is not- UK with the 23- 14 lead with 10 minutes left. Kansas must improve its help defense- no one is helping but Withey. This game might become a blowout if Kansas can’t get to 35 points by half. Kentucky is starting to heat up from the 3 point line- bad news for Kansas. Kansas is clearly frustrated- UK winning the rebound battle big- UK is giving up anything easy. Good finish to the half for Kansas but heads into the break down 14. Sloppy start to the second half for both teams. Kansas is settling offensively- not converting inside- missing opportunities. TO’s are starting to hurt Kansas. Freshman mistakes are hurting UK- KU only down 10. UK hitting the 3- pushing the lead back to 16. Back to back 3 point plays for KU after the block on Davis. Taylor has played a solid game and has kept Kansas in the game. Kansas down 7 – pressure on Kentucky- how will the freshman handle this? A huge 3 for Teague- thought it sealed it till Kansas hit a 3 to answer. UK is looking shaky- Did the officials miss the walk? That’s twice now that Kansas has turned the ball over in the end, once without even getting a shot- cant do that and expect to win. Too much time spent on last possession and then the walk….Game over. Established deep post position several times tonight- very strong player- defensive rebounder- rebounds the ball hard. Showed a high release and good footwork on an early 1 dribble pull-up from top of key. Takes the ball up strong with 2 hands. Showed solid post footwork and a nice hook shot. Good P/R player. Nice FT stroke- flicks wrist, good rotation. Has a solid base and good body control in air. Beast in the paint- fights for rebounds and positioning. Clutch- wants the ball in crunch time- knocked down 2 huge FT’s with a minute and a half to go to pull with in 5. Slow lateral movement guarding perimeter- struggled to stay in front of Jones. Even though he was getting very deep in the post- struggled to finish because of lack of athleticism and length. Glued to man on the defensive end- needs to improve defensive positioning and shot blocking. Gets in a hurry when performing his post moves and doesn’t finish like he should- rushes. Has a tendency to pick up cheap fouls. Struggled for the most part this game. Matched up with Terrence Jones on each end tonight and struggled to guard and score throughout. Physically he is ready for the pounding and grind of an 82- game NBA season, but he is a tweener position wise. Not long or athletic enough to play the center position- cant guard or score over a taller and stronger player- and is not quick enough to guard a PF away from the rim. I saw glimpses tonight of perimeter offensive play, but for the most part he likes to bully his way inside for easy scores. Plays hard and competes throughout the game. Could be a player similar to a DeJuan Blair for San Antonio or a Glenn Davis- a player who can step out and hit the midrange jump shot and is strong enough to play inside. He should be a top 10 pick in the upcoming draft- will be a solid role player for a long time in the L.
Extremely long and athletic. Tremendous rebounder- rebounds ball with 2 hands and at rim level or above. Excellent weak side shot blocker- good timing- keeps the ball in play and creates transition opportunities for team. Does a great job with the dribble hand-off. Influences shots he doesn’t block. Active on the offensive glass. Loves to go baseline on offensive end in the post. Has the ability to face the basket and make a move, whether it be the up and under or the hook shot- still could stand to improve offensively- shows the ability to be a solid offensive player. Nice shooting stroke out to about 18’. Very good body language- stoic facial expression. Will need to work on shading out on screens- didn’t see him do it this game. Must get stronger in the upper body- got the ball taken from him on a couple of rebounds b/c of lack of strength. Struggled offensively- had a handful of solid offensive possessions and moves, but otherwise struggled with balance and finishing. Well played game tonight for Davis, who solidified his rank as the number 1 pick in the upcoming NBA draft. Even though he struggled to score tonight- he was still a threat and drew players away from the help side to keep a body on him and to keep him from catching lobs and tipping in missed shots. He makes a difference even when is not scoring- draws so much attention. A player that coaches have to change and make new game plans because of him. He is active on the glass on both ends and is unselfish and plays team basketball. Game changer on the defensive end- blocks shots and alters those he does not block. It is tough to compare his game to an NBA player- DeAndre Jordan might be the best comparison as a player who makes a difference on both ends. Other shot blockers do not have the offensive repertoire that Davis has. He will need to add another 30 lbs. or so to his frame and once he does he will be an All-Star player for years to come. Thirty-five, ten, twenty-one. These numbers are related to a lottery, although maybe not the one you may be thinking of. The thirty-five scouts, ten general managers, and twenty one total NBA teams represented at Baylor’s home game against second ranked Kansas had a lot to do with potential lottery pick Perry Jones III. While there were several potential NBA players in the game like Kansas’ freshman sensation Josh Selby (PG-SG, 6’2”, Freshman) it is no surprise that many of the NBA scouts and GMs were there to see Baylor’s Jones. The Jayhawks from Kansas dismantled their Big 12 rival 85-65 with outstanding ball control and efficient shooting. The Jayhawks had an average second half but only missed six shots in the first half, shooting 79% from the field and built what turned out to be an insurmountable lead over the Bears. Jones is a very respectable replacement for the 6’10” Ekpe Udoh who has moved on to the NBA. Offensively, Jones is more than capable of replacing Udoh, however, Udoh set the Big 12 single season record for blocked shots last year so Jones has big shoes to fill on the defensive side of the ball. Before Monday night’s Big 12 matchup Jones was averaging 13.1 points and 7.3 rebounds per game with the 4th best field goal percentage in the conference with 57.1 percent. 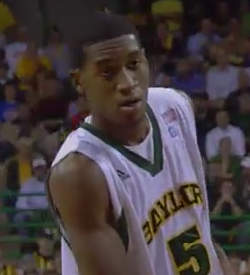 The freshman sensation bears a striking resemblance to NBA star Tracy McGrady. In fact, Jones even plays a little like McGrady in some facets such as his shooting form, free-throw style, and demeanor. While Jones was a little too laid back at times, especially on the defensive end he showed great athleticism throughout the game. The freshman easily dunked over defenders in half court offense and showed tremendously soft hands when catching the ball on the interior. Jones rarely hesitates when going up for a shot and his quick leaping ability makes it difficult for opponents to defend him. Perry Jones relies too much on his leaping ability to grab rebounds and is not as sound at boxing out as he should be. Jones has good touch out to around 17 feet but will need to improve his consistency on his outside shot. The 6’10” potential lottery pick showed surprisingly good court vision and ball handling ability considering his size and seems to enjoy creating shots for teammates. Jones is a good on ball defender as well as a solid free-throw shooter and has overall fluid movement on the offensive end. Dunn was one of the main catalysts in Baylor’s impressive showing in last year’s NCAA Tournament where the Bears made it all the way to the Elite Eight. Dunn has good height for a guard, good overall strength, and can shoot lights out. However, Dunn has flown under the radar most of his career and is an undervalued player at the college level. The senior guard tried to take everything in stride in the first few minutes of the game, not rushing or forcing bad shots. This is impressive in itself for a senior with range playing in front of a throng of professional scouts and GMs. Points were hard to come by all night for the Bears and so were possessions so Dunn did well to get into double figures. Overall Dunn has a smooth jumper, although it was off against the Jayhawks and he moves fluidly with and without the ball. Dunn did take some questionable shots and it seemed as if he was trying to shoot the Bears back into the game by himself. Dunn needs to improve his ball handling, court vision, and ability to handle pressure as evidenced by five costly turnovers. The slightly shorter half of the dangerous Morris twins, Marcus Morris was the high scorer in the game and showed why is making a run for Big 12 Player of the Year. Marcus showcased a tremendous mix of inside-outside play and it is likely that scouts thought highly of his solid post moves coupled with his ability to bring defenders outside and hit the three. Going into the contest, Marcus was leading the conference in field goal percentage with an impressive 60 percent. Morris needs to improve his ball handling because he often dribbles to high and makes it easier to get the ball taken away. In addition, Marcus needs to improve his consistency on the defensive end because his intensity seemed to wane at times. Overall the Morris twin is strong, has above average athleticism, and is a consitent scorer with decent range. Markieff Morris may be one of the most improved players in college basketball this season and showed that he has the ability to fill up a stat sheet on any given night. Markieff started re hot for the Jayhawks, going seven for seven in the first half and showed that he also has really good range for his size. While Markeiff is still playing in the shadow of his twin brother, he is making it clear that he really has a strong game as well. Markieff does not seem to like contact as much as his sibling but more often ops for finesse type moves in the post. At times Markieff tries too hard to get blocks and finds himself out of position for getting rebounds. While he needs to improve his conditioning and how much he relies on his brother for support, Markieff has good skills that could translate into significant minutes in the NBA. With his height and athleticism, Josh Selby improves the point guard position left vacant by Jayhawk great Sherron Collins. However, only time will tell if Selby can live up to the high standard of poise, ball control, and scoring ability that Collins displayed during his collegiate career. Selby did show some flashes of greatness in the game, like his outstanding agility and lightning-quick first step but also made some freshman mistakes along the way. At one point in the first half Selby had a great steal but then made the bad decision to shoot a three-pointer during the fastbreak. Selby took several questionable shots that may have been disregarded by many because Kansas had such a sizable lead but in a tight game, those ill-advised shots can be costly. Selby needs to improve his outside shooting range, his intensity on defense, his decision making, and his ability to lead. In essence, Selby is a typical freshman in college basketball except that he has talent and potential that is far above average. Selby has the ability to become one of the best point guards that Kansas has ever had if he does not opt to go pro early. Selby is a very good young point guard with loads of potential; however, he is not ready to be an NBA player at this time.